The darlings of March are trying to put things together in January. CATONSVILLE, Md. — The darlings of March are trying to put things together in January. “We just know we got to be playing our best ball come tournament time,” said UMBC forward Brandon Horvath. “We got a lot of games left to play and we still think we're going to be playing our best basketball come March,” added UMBC forward Joe Sherburne. UMBC knows they'll be getting their opponents' absolute best. They've already seen it this season. Everyone wants a piece of the team who last year became the first 16-seed to beat a one-seed in NCAA Tournament history, when the Retrievers dismantled Virginia. “It says a lot about where our program is at right now. Other teams do want to play against us,” said UMBC Head Coach Ryan Odom. The Dogs are 9-9 overall this season and 1-2 in the America East Conference. When they’ve had success their defense has led the way. UMBC is first in the conference, and 38th nationally, allowing 65.3 points per game. They’re 10th in the country with 153 total steals. On Wednesday the Retrievers host 5-12 Binghamton at 7:00 p.m.
That game will be one for the record books. Sherburne, who is a graduate student, is set to start his 113th game for UMBC. That will set a new all-time high for the program. He’ll break Terence Ward’s mark of 112 starts set between 1997 and 2001. “He's the guy that you can count on. He's the reliable player and he's gotten better every year,” added Odom. 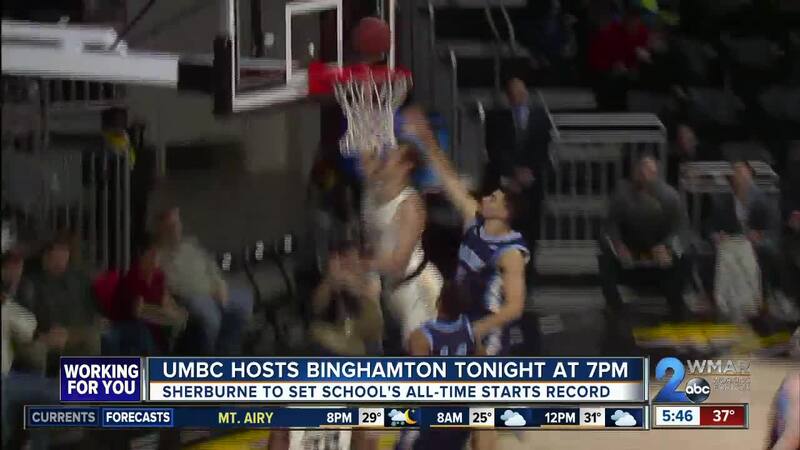 Sherburne needs only three rebounds to become the third UMBC Division I player to record 1,000 points, 500 boards and 200 assists.